Clare Daly T.D. and Maureen O’Sullivan T.D. 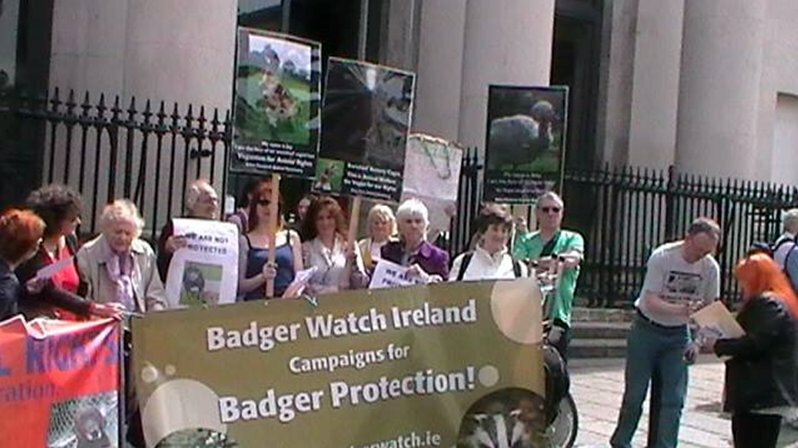 protests with animal protection groups at Dublin Castle – Animal Welfare Bill did not go far enough. Badger killing as a career? The Department of Agriculture is seeking contractors to carry out a cull of up to 12,000 badgers over a two year period in an ongoing effort to tackle tuberculosis levels in cattle. The contract will be worth in the region of €2m and will involve the capture and shooting of the animals. Badger culling has been used as a way of reducing the levels of the disease for decades, with 6,000 badgers per year culled in recent years. Contractors will be tasked with setting snares near known badger setts and shooting any animals they catch. The carcasses will then be tagged and delivered to a central collection point. However animal welfare groups are hotly disputing the need for any more culling, with the Irish Wildlife Trust claiming many studies show badger culling is ineffective at stopping TB outbreaks in cattle. The IWT also point out that years of culling in this country has not got eradicated bovine TB. Farmers argue the latest cull is necessary and say there is ample evidence linking infected badger populations to the spread of TB to disease free cattle, something that can have a devastating impact for farm families. In a Department statement it was pointed out badger removal is undertaken "only in areas where badgers are the likely source of infection." The statement added that the incidence of bovine TB in herds has fallen greatly in recent years due in great part to the strategic removal of diseased badger social groups. The new badger removal contract will also involve an element of badger vaccination aimed at reducing badger TB levels without culling. Vaccine field trials involving several hundred badgers are already taking place but the Department says it will be some years before badgers culling is abandoned. Meanwhile, Irish Farmers Association President Eddie Downey has said that levels of TB remain unacceptably high in Wicklow, despite significant progress towards the eradication of the disease nationwide. Recently, Wicklow farmers have also been pointing the finger at deer and are now calling for a cull in the area. Thugs used live fox used to ‘blood’ dogs. People were shocked by a Sunday World expose on September 14th which carried a story where a live fox had been captured by a gang. The purpose was to engage in, what is commonly known as a ‘blooding’ session with a pack of hunting dogs. This is a recognised method of training dogs to kill. The practice is much favoured by the owners for preparing the animals for badger –baiting and dog-fighting activities. Both activities are highly illegal but are favoured as entertainment and betting mediums for criminal gangs. The video was posted on-line by a Waterford -based gangster. It shows a terrified fox been torn limb from limb by as seven blood-crazed dogs each fighting hard for their own piece of the action. In one picture the fox is seen held by the hind legs. On closer inspection it is apparent the tail has been removed. In the background, men can be heard cheering on their dogs as the fox is being dismembered. As the law stands, it is not illegal to kill foxes in this country. In the wild they are afforded little or no protection. According to the 1911 Act it is an offence to cruelly ill-treat a fox if the animal is held in a captive state. A fox caught by the hind legs could hardly be in a more captive situation. The gang boss is currently facing criminal charges and is a target for Gardai in the south-east where he and his gang are responsible for a wave of violence in the area. Members of the mob are involved in drug dealing, money lending and other crimes. They have purchased a number of houses in the area, paid for in cash. Earlier this year the gang petrol-bombed a car belonging to local Sinn Fein Councillor, John Hearne who have taken them on and helped victims stand up to these thugs. This particular case of wanton cruelty is currently under investigation by the Waterford Gardai. We sincerely hope for a positive outcome and those involved will be duly punished. The courts must send out a clear message. This type of barbaric cruelty has no place in a civilised society. Earlier this year several groups, which included, The Irish Council Against Blood Sports, Badgerwatch, The Irish Wildlife Trust, Northern Ireland Badger Groups along with other animal protection Groups united to form Team Broc. It is indeed heartening for Badgerwatch, (now in its twenty-fifth year of campaigning) to see dedicated and experienced parties coming on board. Never too late. Strength in numbers. Some time ago, the Farmers Guardian (UK) published an interview with senior veterinary officers from the Department of Agriculture (DAFM.) concerning the culling strategy in Ireland. Agriculture’s officials claimed “despite the current emphasis on reducing the badger population, Irish officials call it a ‘stop-gap measure’ that will not eradicate TB in cattle. Only a vaccine, they say will eradicate the disease”. It is unacceptable that Agriculture would trivialise the decimation of our precious badger population, knowing full well the acclaimed culling strategy played little or no role in eradicating BTB. Since the mid-eighties, our Government have killed well in excess of 100,000 badgers for their alleged role in the spread of BTB. According to the Dept. of Agriculture (DAFM) the route of transmission is not fully understood. In short they don’t know. There’s not a shred of sound scientific evidence to back up DAFM’s claims. Other countries have been successful in curtailing the disease by pursuing a non-culling strategy. If culling badgers is the solution to Ireland’s BTB problem, we would have been declared BTB-free years ago. It has not happened. Three decades of killing badgers must stop. Unfortunately, the killing has become something of an industry in this country with millions spent each year to fund it. Who funds the killing? The millions involved are drained annually from the veins of an already overburdened Irish taxpayer. This may come as a shock to Sean Citizen. The task ahead is not an easy one. Unlike England and Wales, we have to contend with public apathy which extends to our elected representatives. The latter have, with the exception of a faithful few, gone for the soft option, blame the badger. Team Broc has its work cut out. Joint Badger Trust and Care for the Wild Press Release. Rates of bovine TB (bTB) in cattle have fallen yet again according to new figures, with the incidence of the disease reaching its lowest point since 2003. Figures released by Defra show that, between Jan-April this year compared to the same period in 2013, the number of cattle slaughtered because of bTB is down 2.6%, and the number of new bTB incidents is down 2.3%. Most importantly, and confirmed by Defra in a tweet, the incidence rate for April is at 3.1% - the lowest single monthly incidence rate since Aug 2003. Dominic Dyer, of the Badger Trust and Care for the Wild said: “Every month we’re able to see a reduction in the impact of this disease, and every month we’re able to congratulate Defra and the farmers on the measures they have taken to achieve this including better bio security on farms and tighter controls on moving cattle. It doesn’t include culling badgers, because the impacts of the trials last summer won’t have made any difference to these figures. What these figures are doing is signposting the way forward – focussing on the cattle, on detecting the disease more accurately, and shutting it down at the farm gate are measures that will beat this disease. The Badger Trust has launched a Judicial Review against the cull, which is due to be heard at the High Court in a few weeks. A protest march against the cull is taking place tomorrow (Saturday 19th July) in Tewkesbury, Gloucestershire, in the heart of the cull zone. The badger cull, conceived and administered by the Department of Agriculture, Food and the Marine and funded wholly by the Irish tax-payer, has been responsible for the snaring and death of around 100,000 badgers to date. The DAFM states that it “believes” that the culling of badgers has contributed “significantly” to the improvement in the disease situation. At a staggering annual cost of around €3.5 million, Minister for Agriculture Simon Coveney claims that this expenditure is “cost-effective”. These assertions may seem plausible, if indeed there was hard evidence to support the government’s case. There isn’t. The government is forced to say that it “believes” badger culling has reduced herd TB because it doesn’t have one shred of evidence to support these claims. The similar downward trend in both parts of Ireland is due to the more robust cattle measures and testing that exist here compared to Great Britain. There are some differences in the long term North-South trend along the way but these can be attributed to variations in test regimens, not badger culling policies. The government should certainly be looking to the North, which has never culled badgers, for an evidence-led TB policy. Irish tax-payers would have good reason to be a little more than upset to learn that the long-running slaughter of badgers has been nothing more than a costly distraction. The most reliable evidence now clearly shows that the solution lies with controlling cattle to cattle infection, not scape-goating broc. Mike Rendle ( address with editor). In the animal cruelty industry, words are employed as a verbal cover for barbaric acts of animal cruelty. The Department of Agriculture recently put out to tender the supply of 25,000 units of ‘Packaging Solution for Biological Material’ as part of their equipment list in the campaign to rid the country of bovine TB. In simple English these are body bags to carry the bodies of executed badgers. This is the fate of up to 6,000 badgers within the next 12 months as the department ramps up its programme of culling badgers. This killing takes place despite the fact that the badger is protected under Irish wildlife protection legislation. As ever in Ireland, a dispensation from the rule of law permits the annual slaughter of this animal to take place under the guise of scientific research. The snaring and killing of badgers at the behest of the Department of Agriculture is State-approved savagery. Bullfighting and other cruel blood sports continue to shame twenty-first century society, but thankfully the tide is turning in the battle against such practices. This month's vote in the European Parliament to end EU subsidies to farmers who breed bulls for Spanish bullrings received unprecedented support - with 323 of the 690 MEPs voting for it. Some 309 voted against. Unfortunately, this majority was not sufficient to see the proposal pass, as 58 MEPs abstained in the vote and the required majority quorum of 376 was therefore not achieved. Even so, the result is a major step forward in the campaign to end the indirect funding of bullfighting by EU taxpayers via the subsidies. A majority of MEPs are now openly against bullfighting and the next vote on the subsidies issue will bring closer the demise of this nightmarish blood sport. Each year, the EU provides an estimated €130m through Common Agriculture Policy payments to people who breed bulls specifically for bullfighting. Bullfighting relies heavily on the subsidies. Without these payments, the horrific "industry" would be on the brink of collapse as attendances are already down at all bull rings in Spain and most Spaniards, according to opinion polls, are now opposed to the practice. Though it may seek to hide behind the mantles of custom and tradition, and in spite of all the romanticism surrounding it, the truth about bullfighting is unambiguous: each bull is subjected to deliberate and agonizing torture.At the end of the performance he plunges his sword between its shoulder blades.